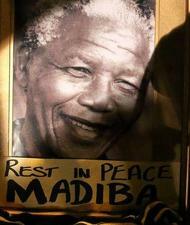 Today all media are full of Nelson Mandela - I feel sadened, haunted, priviledged, at awe ! and very concerned! We prepared „AFRICA BEYOND POVERTY“ between 1993 and 1995 [link] and Proceedings [link] so I am „all ears“ with all the „view“ and "words" comming in. Where is the difference, where have we been 20 years ago, and where are we today? regarding Africa and the World ? I feel „we“ fail today and failed bitterly 20 years ago. Have our contributions, even well meaning and with full energies, have provided only little, or even worse, no lasting, even negative results!? Can we „bend the trend? How do I come to such strong sentiments and questionings? I presently hear in our German National TV Nelson Mandela being quoted: Your playing small does not serve the world. - DICH SELBST KLEIN ZU HALTEN, DIENT NICHT DER WELT. taken from 'A Return To Love' (1992) by Marianne Williamson [link] This are NOT ! his original words but telling a lot and making me think.. The issue is close to what I am fumbling here tonight and for years. This is close, but not quite what is presented in the media and cited everywhere. Immediately, Mahelia Jackson is humming in my mind: If you go it, flaunt it but who is to speak up and when and on what subject? and who will listen when every word raised is under suspicion of self-service and fundamentalism, as wise people are silent ! In one form or another, the most enlightened traditions enjoin people: To Dare, To Know, and To Be Silent We had much exchange about this being enlightened or not ! by "being Silent" and I qoted for him WISSEN _ WOLLEN _ WAGEN - (The full text below). So is it right to be silent ? or to speak up at the right time, on the right subject, to the right audience in the right situation, terse and inviting/empowering. Issues that matter to make a difference! You see me getting toughed, as this is my conern since long, as covered in [link] with our Magic Roundtables, and on the [link] website, which is focussing more on deliberation, dialog-design, and peace-making, as the next step, after lesrningbto listen, subsume, resonnate, and speak up!! I struggle since long with this topic of when to speak up, where, how and about which topic in which way ! Have to leave the trainnow but need to continue as I feel this issue is central to me and so maybe also for many others !!! This small Rhyme we tried to dig in some other languages cultures. I need to check the endnote or emphaasis again - what to German French English have learned about this 100 or more years ago, and was there a diffence ! ? to the better or worse!? Wissen, Wollen, Wagen war je der Leitspruch der Weisen. Friedrich Wilhelm Nietzsche (1844 - 1900), deutscher Philosoph, Essayist, Lyriker und ... [ ]. Wer die Menschen einst fliegen lehrte, hat alle Grenzsteine verrückt. Je höher wir uns erheben, um so kleiner erscheinen wir denen, welche nicht fliegen können.